Knitting patterns come as either written instructions or as charts. Stitch-pattern charts use a square to represent each knitting stitch and a symbol inside the square to indicate how to work the stitch. Although there’s no universal set of symbols, each knitting pattern that uses a chart also provides a key to reading it. Always begin by finding the key to the chart. When reading charts, pay careful attention to the key provided. Various publishers, designers, and charting software programs may chart the exact same stitch or series of stitches using different symbols. The trick to reading chart patterns without getting confused is to remember that you read a chart from the bottom up because it shows the knitted piece as it’s knitted — and in nearly all knitting, you knit from the bottom up. Right-side rows: Right to left. Wrong-side rows: Left to right. Charts represent the pattern of the knitted fabric as you’re looking at it — the right side of the fabric. 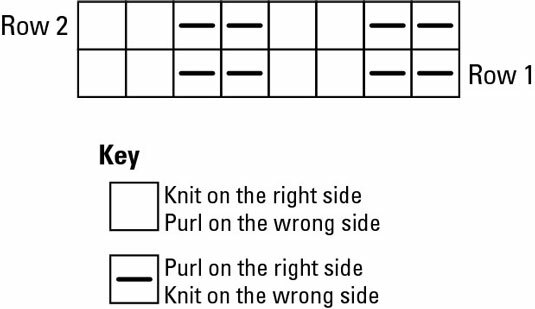 So, on wrong-side rows (from left to right) you must purl any stitch that has a knit symbol and knit any stitch that has a purl symbol. This switch isn’t difficult after you get the hang of it, and the pattern key will remind you. If the design uses a repeating pattern, the chart generally shows a single or double repeat and not the whole garment piece. Unless the number of stitches in the piece you’re making is an exact multiple of the repeat, you’ll have to begin and end on a part of the repeat. The chart tells you where to begin knitting the repeat. You can use self-stick notepads to keep track of your place on the stitch pattern chart by sticking them along the row above the row you’re currently working on. Seeing only the rows on the chart that you’ve already worked helps you to orient yourself.